April 1st Marked our inaugural online membership sign up and renewal process launch. We’re very excited about this new partnership with Pickleball Alberta. Please note each member of your family or household will need a Unique, Individual Email Addresses associated with their profile. The system will not facilitate the sharing of email addresses. Our membership year runs from May 1st thru April 30th annually. The annual membership fee for our 2019 Season commencing May 1st is $60.00. We do not presently offer prorated membership fees. Please note your membership is non transferable. Your membership includes unlimited outdoor court play and preferred pricing and access to select indoor Pickleball Venues and Events. Watch for future announcements regarding the opening of the 20 new courts. A portion of your RDPC membership also includes membership for Pickleball Alberta & Pickleball Canada. In addition to unlimited outdoor play as per the outdoor play schedule. Members will be able to register for indoor play at preferred rates. Please note, all indoor pre registrations are also non transferable. Your membership to play pickleball is much like a gym membership. It is for you to play and access the facility and courts. It is not so you can give “your spot” away because you’re ill, busy, or on vacation. No refunds or partial refunds will be given. From time to time, the RDPC will schedule courts and play times by skills ratings, gender, drills, and other specific uses. While you do NOT need a skills ratings to play in open/drop-in court times, there will be courts and times reserved for club rated and tournament rated players. 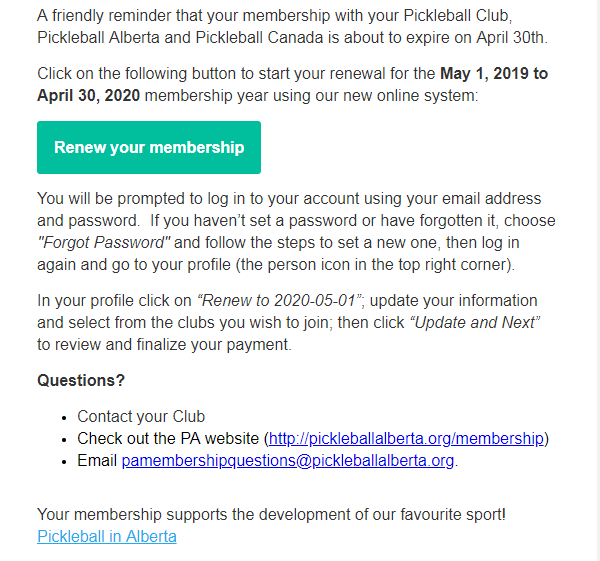 All members by signing up as a new member and those renewing membership agree to abide by the Red Deer Pickleball Club’s Bylaws, and Policies. This includes our Code of Conduct, and Discipline policy. Click Here to be Register to Be a Member of the RDPC. The membership year runs from May 1 to April 30. Membership fees are not prorated for a partial year. Note: during the annual enrollment period you are able to join more than one club by selecting them in the “Clubs You Wish to Join” field.